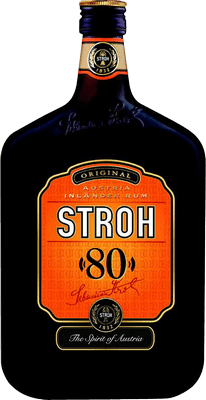 Have you found an online vendor selling Stroh Original 80? Aroma: Used bowling shoes. Fresh horse urine. Burned Christmas ornaments. Taste: Charcoal briquette lighter fluid. Plutonium-90. Soil. Toffee. As others have mentioned, it's hard to even label this as a rum. It's an overproof alcohol with some mix of flavours going on, but any taste is almost immediately lost to the inevitable burning of cheap alcohol. Avoid. Rum or not - that is the question. But it burns all the way down..
Is it or isn't it a rum? Debatable. One source says it's made from "sugar cane by-products" (whatever that is) and another source says it's made from sugar beets. Before I share my views on this...er..."rum"...let me explain that I am also a chili-head. That is, I love hot sauces. However I know my limits. You're not going to ever see me eat a Carolina Reaper pepper....ever...nor slather on a lot of hot sauce made from the Carolina Reaper pepper, the hottest pepper on the planet reaching as high as a little over 2 million Scoville units (for comparison, the typical jalapeno ranges from a mere 2,500 to 10,000 Scoville units). Well it's the same for rum...especially this "rum"...or whatever you want to call it. At 160 proof it's double the ABV of typical rums. In fact, the neck label on my bottle reads, "CAUTION FLAMMABLE". The aroma in the bottle hints of vanilla extract and maybe caramel. The lower label on my bottle reads, "Rum with artificial flavor, certified colors (FD&C yellow #6, FD&C Red #40, FD&C blue #1 and FD&C yellow #5" so it is possible they used some sort of vanilla extract or artificial caramel flavoring. The color is sort of a dirty orange reminding me of some bad cough medicine my mother gave me...uh...forced down my throat when I was a kid. On the tongue...uh...my tongue got somewhat numb sampling it straight. I THINK I detected some vanilla and sweetness but I can't be sure. However I think it removed a layer of tissue down my throat. I shudder to think what my stomach lining is going through. I have had worse rums than this but I have had more better rums. Frankly, this Austian-based "rum" is way overpriced. I wanted to try a bottle since I have read a lot about it so my curiosity got the better of me. DEFINITELY NOT A SIPPING RUM!!! I do plan on trying some...a small amount...in some Coke Zero sometime...not tonight...and perhaps also with some orange juice to see if that helps. 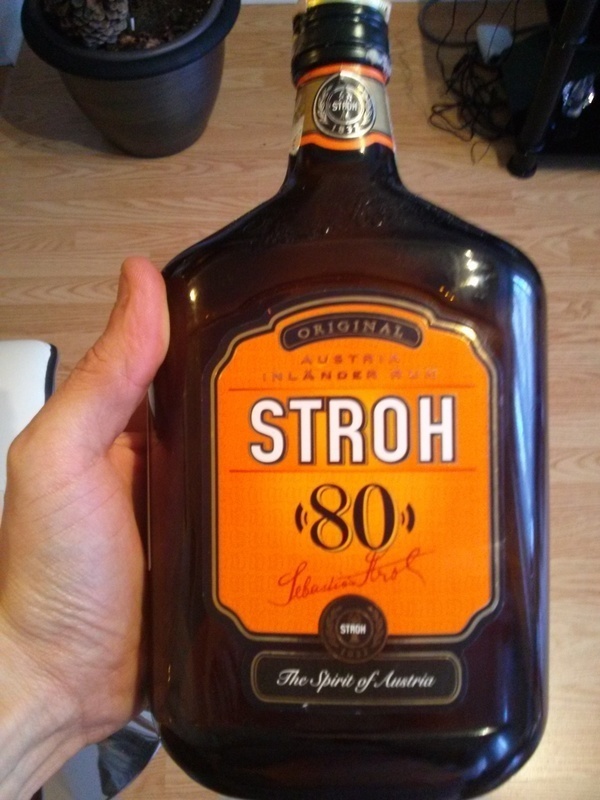 Stroh Rum eignet sich eigentlich nur für Heissgetränke. It's hard to review this as if it was actual rum, because it's arguably not. It does taste great with coke and can drink you under the table if you're not careful. Works amazing with hot drinks, hot chocolate or tea and it's great at low temperatures. Not something you'd drink in a club or on a sunny terrace. Fullbodied fruity nose with notes of rum essence. The palette is very powerfull and brings emense heat, but you can sense a few fruity, barrel, rum notes underneath the burn. It's better then the 60%vol stroh, but still the dominant flavou seems to be rum essence. Should be reserved for hot cocoa after a day on the slopes. it just good if you need to kill someone, but poison is already finished. Do no, but if you wona try this one, keep sure you have grapefruit juice. It’s only way to survive after this “80c kick to your stomach”. Blood awful and not at all rum-like. I drank some of this irresponsibly a long time as ago as a dumb kid at a party and woke up in the morning with a broken leg & no memory of what happened. I tried some recently for nostalgia purposes and it was still unbelievably bad. I would advise anyone to swerve this rum. A "rum" for the party animal. Drink it straight if you dare. Nothing good about this one. This rum is like an emergency shot you take, when you need to warm quickly or get wasted. Or get it on some dried fruit. Then it is good. Not useful as a sipper of course. Treacle, dry. Seems like this is some sort of tincture. The ultimate rum to carry in a hipflask on a night out - and secretly upgrade a plain coke into a rum-and-coke. Strong flavour and ditto alcohol, not for drinking neat, but definitely recommended for cooking. Only if you are real drinkers you can manage to feel the wonderful taste of this rum. Great mixer when used sparingly. Obviously you can't drink this straight-out. Tried it at a party with friends. Pure alcohol made from an old miner's boots mixed with burnt sugar. Nice taste, but 80% is quite much. It is perfect for adding into the christmas Candy. I debated whether this deserved a 1 or a 2. It's terrible. There's no doubt about that. But, if you expect that, and it meets your expectations, does it still deserve a 1? This is on the short list of undrinkable "rums". (There's still debate over whether this is actually a true rum). I try all rums neat before with ice or mixing. This, neat, is like drinking turpentine. Simply horrible. Mixed, the taste is still overpowering. It's 80%, so it's still going to shine in regular measurements. But even mixing at half strength, you cannot get over that horrible taste. If you want to mess someone up, give them this. But there are *far* better overproof rums, that are actually tasty. All the people who rated it lower than 4 don’t know that this rum is not intended for sipping or mixing. This is a rum you need to have because it works pretty well in pastry and for keeping your sugar syrup fresh. This is the only rum I have spit instantly into a Kleenex as going to the sink would be too far. And I was in the kitchen. Tastes like sore or strep throat spray medicine. Absolutely junk. Would rate it with a minus if possible. It makes the Brugal I rated a 5 seem like a 99. Absolute garbage. Do not buy. Stay away. Cannot find any redeeming qualities. Great butterscotch smell and that is where it ends. This has nothing to do with rum. It burns way too fast and is not suited for anything I could think of.